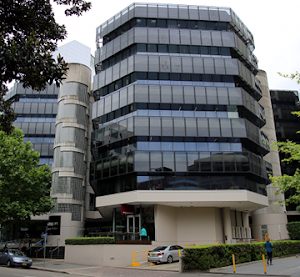 CAD Software Blog: "Foreign DWG File" Scare Tactic from Autodesk? 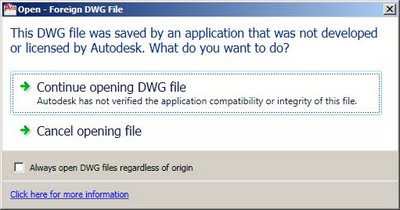 "Foreign DWG File" Scare Tactic from Autodesk? See it? Looking scary ..almost like an anti-virus warning? But read closer: "This file was saved by an application that was not developed or licensed by Autodesk." Well, duh... We knew that already. So why the big warning? Have a wild guess, then read here. Now our concern changes from what was "bad file warning" to "how do I stop this idiot box from opening every time I open a file from progeCAD?" The answer in AutoCAD 2010 is simple: either click the little check box at the bottom which says "Always open DWG files regardless of origin" or disable "Open - Foreign DWG file" in the System "Hidden Message Settings" - it amounts to the same thing. progeCAD is a low-cost compliment for AutoCAD users to reliably create, edit and print AutoCAD files without the high cost of AutoCAD software. A free 30 trial of progeCAD may be downloaded HERE.